Book Condition: Trade paperback First edition. Fine. Appears unread. Trade paperback (US). Glued binding. Contains: Illustrations, black & white. For Dummies. Audience: General/trade. Comment: Trade paperback First edition. Fine. Appears unread. Trade paperback (US). Glued binding. Contains: Illustrations, black & white. For Dummies. Audience: General/trade. Sold by Morningside Industries and Fulfilled by Amazon. Gift-wrap available. 1.0 out of 5 starsWhere's the missing chapter???? This is not a book for dummies. You may find that the author assumes the reader is not a dummy; you'd better know html. There are a lot of instructions in this book for BLOGGERS. There is no information on content management, although it's listed in the table of contents. In other words, a whole chapter is missing from the book. I tried to contact the author, but she never responded to my email. This book should be-retitled "WordPress Blog Design for Dummies".... incredibly misleading. As other reviewers have mentioned, there are two "bonus" web design (content management) chapters and after looking through the book for 10 minutes I finally realized they were ONLINE (you could download them right now for free) and not in the book!! If you are creating a blog and don't want to use one of the online blogging applications, this might be useful for you, but I'm returning this book. Two stars for the misleading title and the "bonus chapters" that are online only, without them telling you that in the book! This is the fourth edition of "WordPress For Dummies" - and the fourth edition I have purchased. There is a misconception that WordPress is easy to use. That is true for the hosted WordPress, which requires virtually no understanding of information technology, computers, etc. But the moment you step out of the cocoon of the highly protected hosted environment, you'd either better have at least a moderate knowledge of CSS, PHP, HTML, FTP, server operations and a few other subject areas. The author does indeed do a good job of explaining what you need to know, but if it is all new to you, it is very easy to get lost. I am a bit puzzled as to what all is new in this fourth edition. One chapter I personally consider important on using WordPress as a Content Management System has been removed from the book and is available on the web. There is now an appendix on upgrading, backing up and migrating and the book, as a whole, is about 40 pages longer. Granted that WordPress is a program that is substantially changed, on occasion, from one version to another. But I think author or publisher or both should explain what is new in each edition. At this point, I use "WordPress For Dummies" primarily as a reference. Substantial portions of it are old news to me, but I have found that I can generally find the information I need quicker in this book - and in better written form - than searching for the same information on-line. Overall, whether beginner or pro, this is an excellent WordPress introduction, guide and reference. Beginners should understand, though, that WordPress is not drop-dead simple once you contemplate modifying it and especially when you leave the security of the hosted version. I will preface this review that I am a technology professional. Web servers and their settings are not a focus of mine, but I am not completely unfamiliar with them. I purchased this book to assist in being as knowledgeable as I could be for the launch of a blog idea of mine. I decided for the initial phase to keep it on the wordpress.org hosting until I reach a critical mass to consider a custom hosting solution. For those doing the same, this book does not offer much more detail than the excellent guides provided for free on Wordpress. I received most of my knowledge from Wordpress online resources vs. this book. For those in this situation you may want to pass on this book. Where this book may/may not be helpful is phase 2 with a custom hosting solution. I can't judge this book yet for that content, however, some of the tactics within may prove sound. I can't offer a fail review as if the Wordpress.org online guides are ignored, this text will offer more value in getting your blog off the ground. It offers content for both paths. The author had moments when it should have been. The entire point of this book is to make our use of WordPress.Org something that if we don't master after reading the book and can make a website as well as the authors, at least start the process of making our own websites. 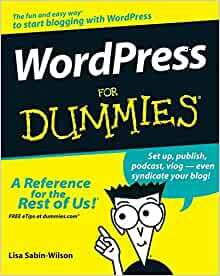 A dummies book for just Wordpress.com and blogging would take all of 50 pages and Dummies can't charge you $25 for that. What goes wrong, oh so much. One is that there is not enough dummy humor. Always useful to break up the monotony of computer learning. But that is a minor point. The major problem of Sabin-Wilson is that she thinks to start telling the readers how to master their use of the software. A good thing, except that she fails miserably at telling us how to use the items. She will have endless tables throughout the book that will tell us the name of a parameter, the information the programming tag. Such as charset, Character settings set in Settings/General, <?php bloginfo ('charset'); ?> and then does not tell us how to use that, or any of the other long lists and wasted pages of text she devotes to such lists. Even the programming code she took us through in her putting a theme together does not work, and has inconsistencies from her step by step instruction to the code she copied and pasted at the end of it. Those are the features that should have made this book a powerful tool. Instead it becomes fluff letting you know that Wordpress is powerful but you need to spend money again to find a teacher who actually covers the material in how you can use it. Not who give you lists of the nouns and verbs you can use, but without the rules of what a noun or a verb is in the context of comparing grammar to Wordpress programming. I have been programming in a lot of languages long enough to know that I can push it and get something out of this book. I can use the list of tens, but this book is not worth $25. If it is worth $10, that is a stretch.